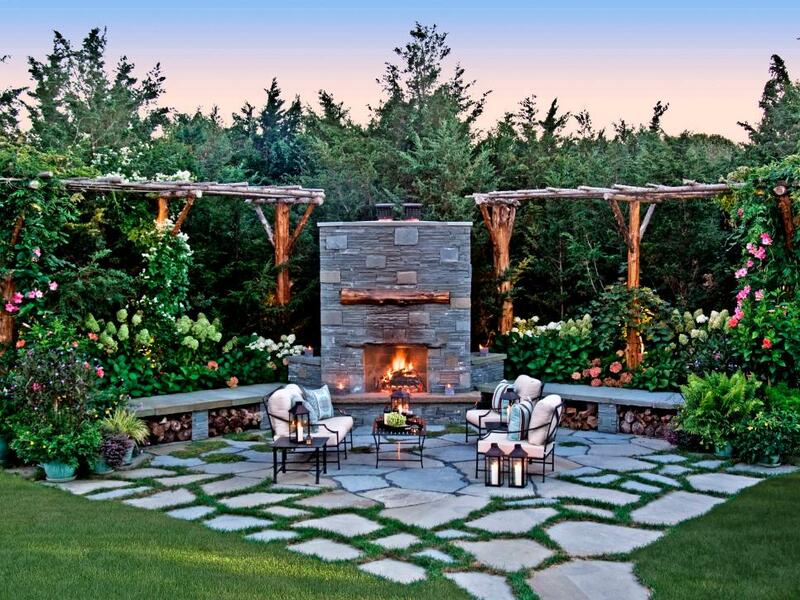 Make the outdoors an extension of your home with smart hardscaping solutions. 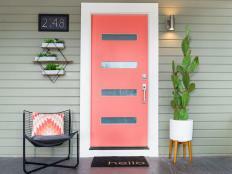 We share our top tips for transforming your front or backyard into a go-to destination. Photo By: Kenny Collins, The Collins Group, Inc.
Photo By: Mickman Brothers, Inc.
An outdoor getaway is the perfect place to flex your creativity. Think of a place that inspires you — whether it's a luxury resort you've visited or even a photo you saw online. 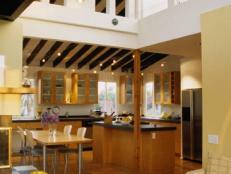 Decide which elements you like best and incorporate those into your design. 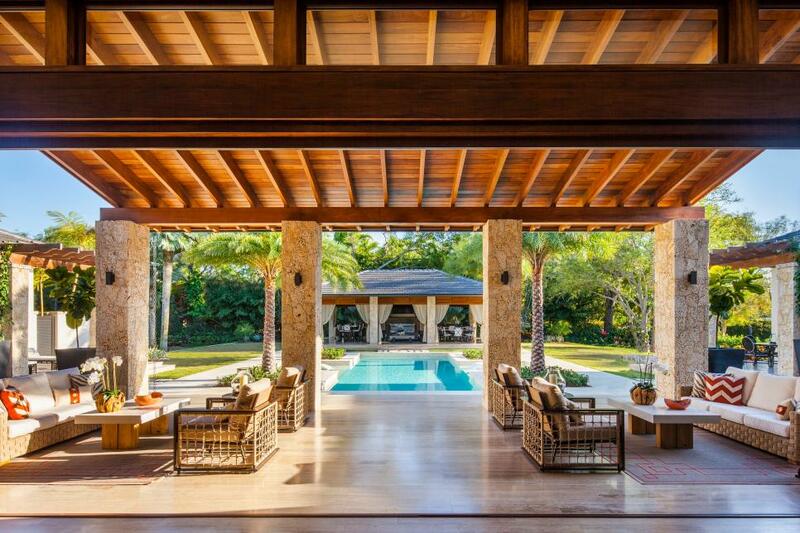 Pulling inspiration from Balinese style, this home opens up to a covered lounge area with stone pillars and Peruvian-travertine flooring. 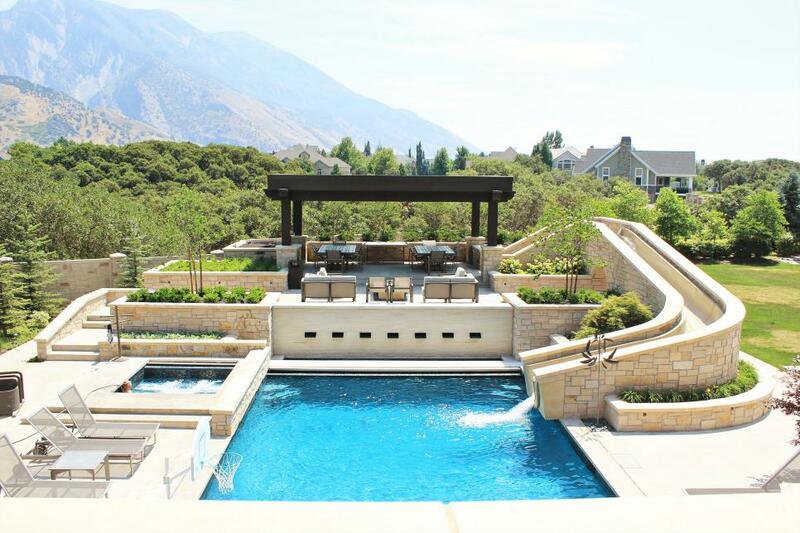 The contemporary pool stretches out to an additional gazebo and outdoor living space. 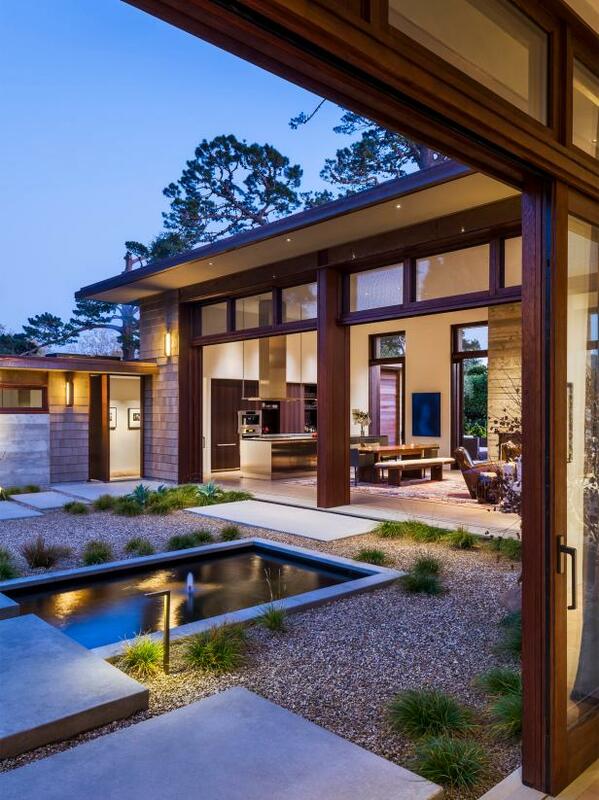 Look no further than your home's architecture for hardscaping inspiration. This paver driveway is a mix of soft tan and brown hues that blend seamlessly with the southwestern style of the home. Easy-to-maintain landscaping full of cacti and low-water plants is just right for the dry climate while also creating ultimate desert curb appeal. 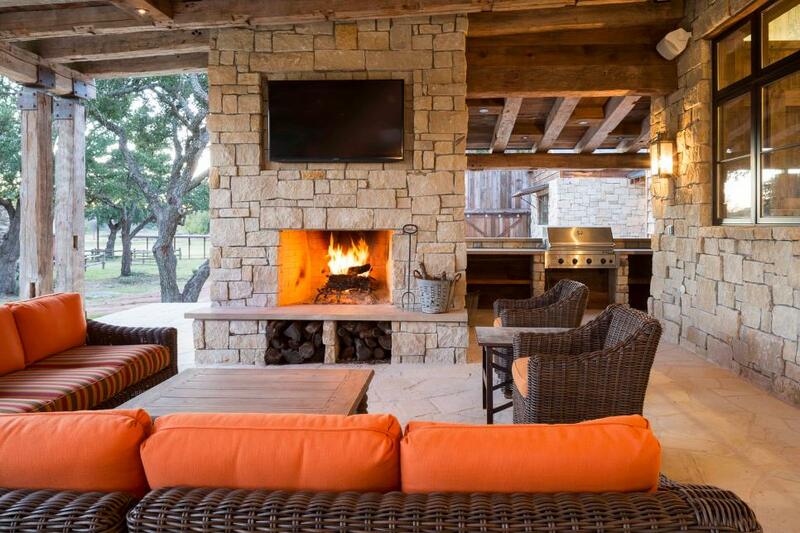 A fireplace takes an outdoor living space from typical to luxurious. It's the perfect gathering spot for adults and kids, whether they're cozying up on a cool evening or roasting marshmallows. The same rustic stacked stone of the home's exterior finds its way to a deluxe and multi-purpose fireplace. Underneath the hearth is built-in storage for firewood and a flat-screen TV above lets you to enjoy the outdoors while watching the big game or House Hunters International. 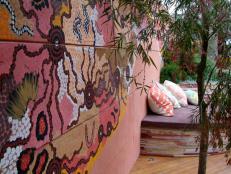 When designing outdoor spaces, know where the sunrise and sunset will happen, as well as the historic prevailing breeze. 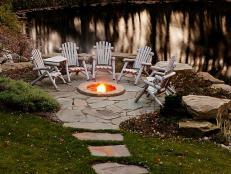 Create structures that maximize the best parts of your outdoor elements. The corrugated metal roof of this covered lounge area provides protection from the afternoon sun, while large cutouts allow for cool breezes to pass through. Hello cool blues and whites. This contemporary backyard retreat highlights the blue of the pool (perfectly, we might add) through well-placed accessories. Stripes of grass soften the white stone patio and keep upkeep to a minimum. 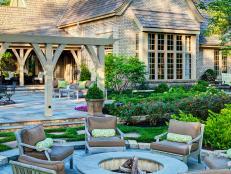 Multiple cozy seating areas are spread throughout the outdoor space so one can sit poolside, warm up by the fire or head under the pavilion to get out of the sun. 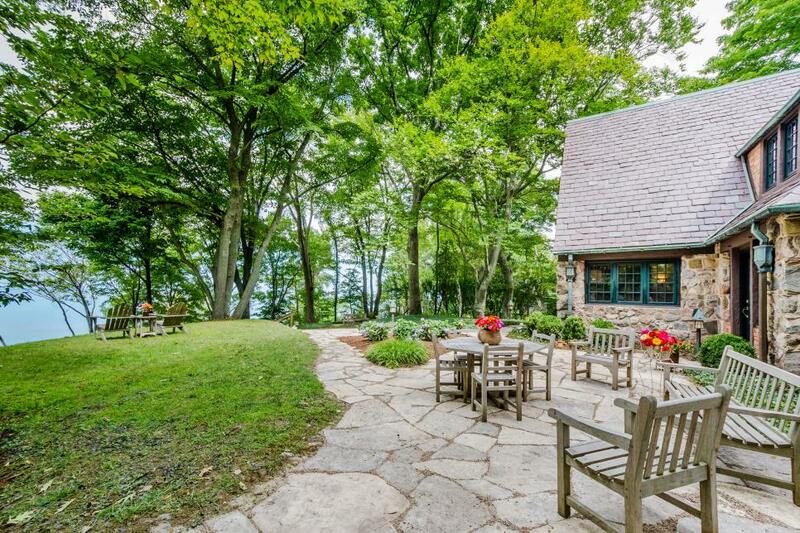 Gorgeous stonework defines every aspect of this home's outdoor space. 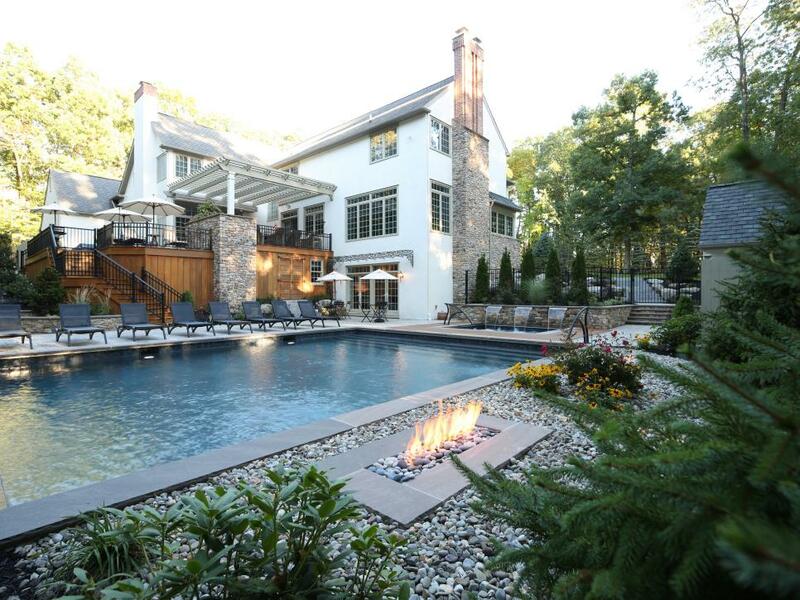 Clean-lined stones mark the perimeter of the swimming pool, as well as the in-ground fire pit, where a bed of pebbles add dimension and texture. Bonus: they require almost no maintenance. The repetition of stacked stone on the home's exterior, the porch and the cascading waterfall ties the entire space together. A combination of different stonework gives this outdoor space a customized and visually interesting look. 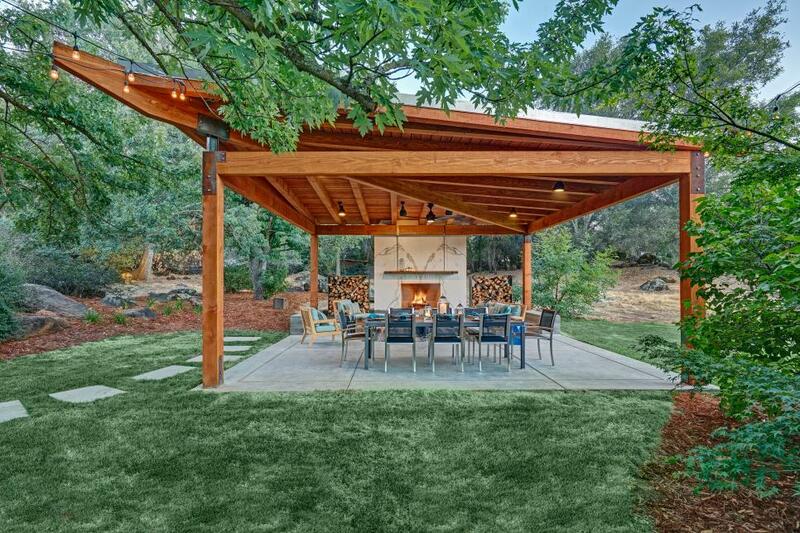 The dining area features etched-finish pavers set in a grid with a pebble border separating it from the tinted concrete, while the living area has shell-inlaid concrete pavers surrounded by decomposed granite. Making full use of the hanging wisteria, this massive structure, which houses a welcoming outdoor living space, has an almost hidden storybook-like atmosphere. 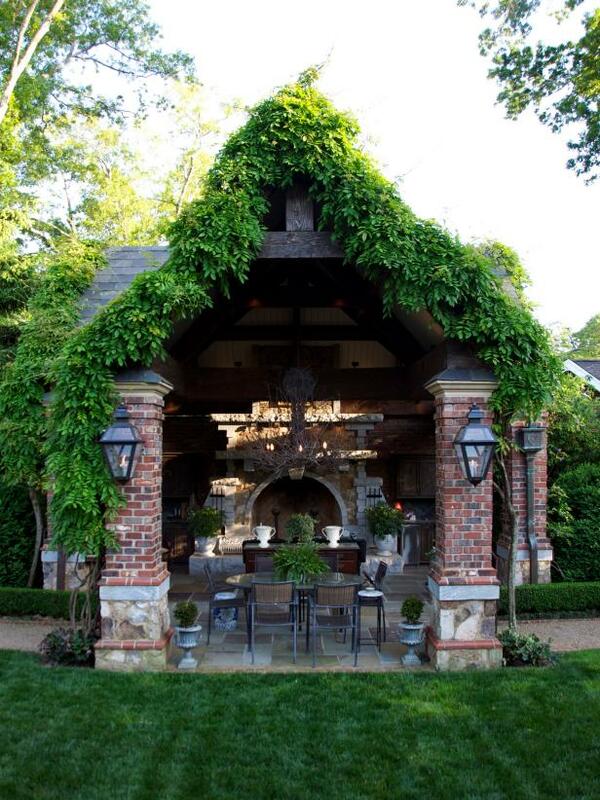 Classic brick columns with rustic stone bases surround the pavilion, creating an Old-World vibe. Truly designed as an indoor/outdoor home, this contemporary patio has a seamless transition between the interior and exterior spaces. Clever flower beds allow for lush greenery to break up the uniformity of concrete, and defined areas — a living space around the fireplace and a streamlined dining spot — enable homeowners and guests to completely embrace the outdoors. Take advantage of the surrounding environment you already have. 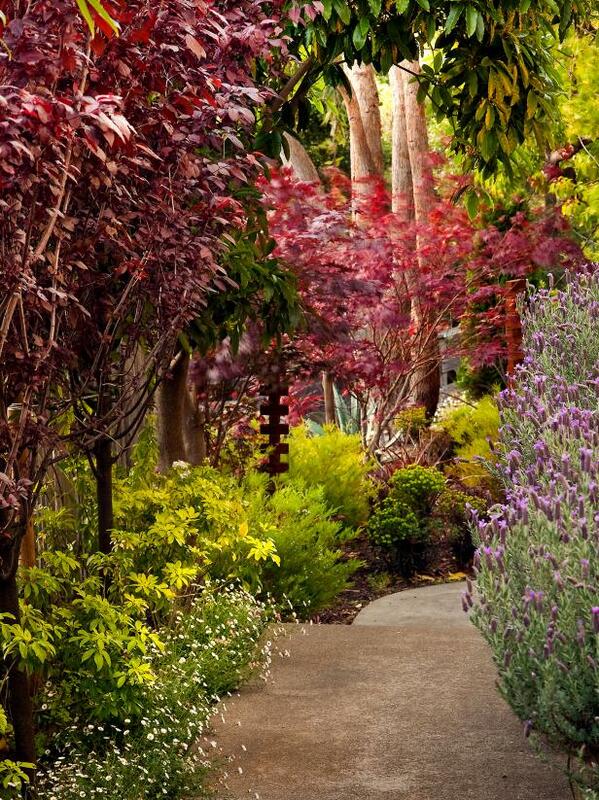 This patio and pergola completely blend into the towering trees and colorful plantings. Concrete and rustic wood stepping pads jump right off the natural stone boulders to lead out to a floating deck above the pond. 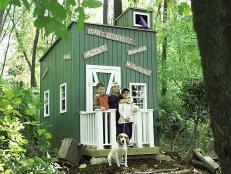 Backyards are a place for adults and kids to relax, enjoy the outdoors and most importantly, play. 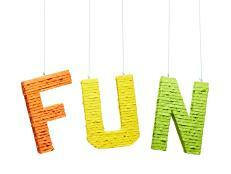 In addition to your patio, outdoor kitchen or pool, incorporate a favorite hobby into your plan. 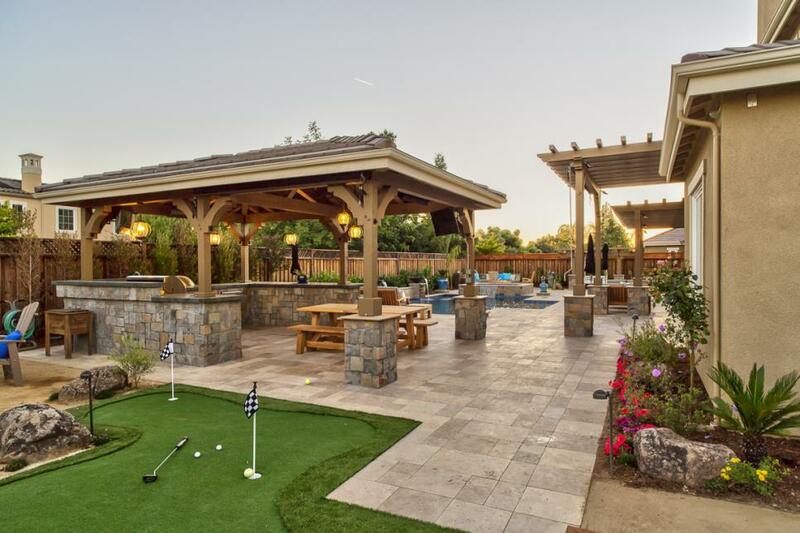 Whether it's a putting green, climbing wall or play structure, think of a way to personalize the space for your family's enjoyment. Mark the perimeter of your yard or separate different areas of your property with smart hardscaping. 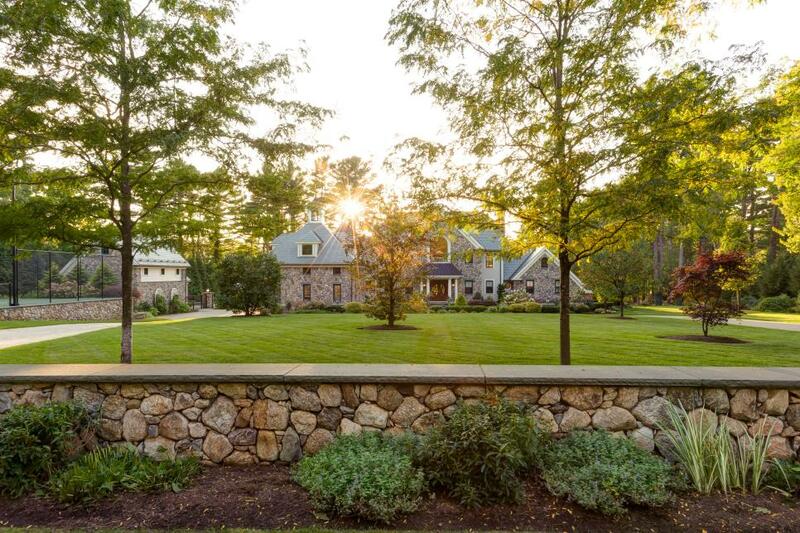 These low-level stacked stone walls reflect the house's architecture, define the estate and still permit for amazing views of the landscaping and home beyond. Crossing over water is an enjoyable experience no matter how old you are. 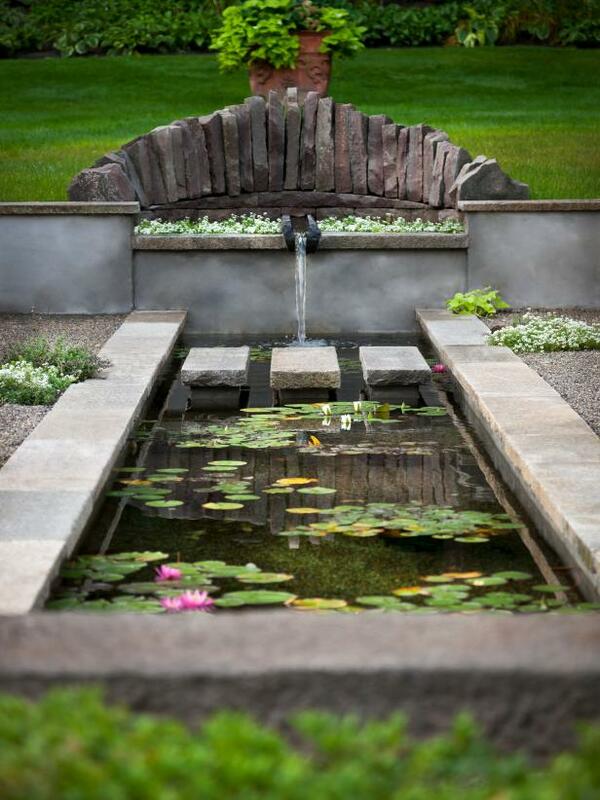 Even at the chicest event, the floating paver walkway will have you feeling like your hopping from lily pad to lily pad across the most elegant of ponds. 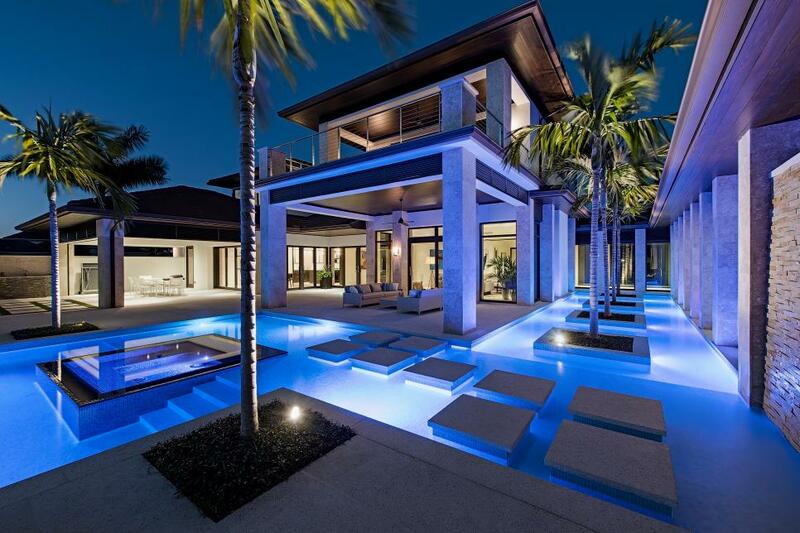 This luxurious space shows that water needn't be a hindrance to amazing hardscaping with palm trees planted firmly in the middle of the pool and the clean-lined yet out-of-the-box layout. You might think it'd be hard to pull your eyes away from the gorgeous mountain views in the distance, but with a playful and stunning outdoor design like this, there might be a little competition. 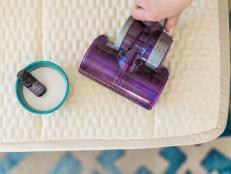 From the covered living and dining areas to the spa and pool complete with water slide, there isn't a kid or adult who wouldn't be ready to have some fun. 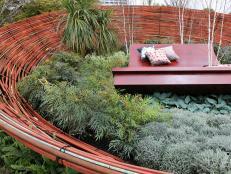 Select materials that will stand the test of time and plants that will thrive in your surroundings. No one wants an aspect of their design that is a battle to maintain. 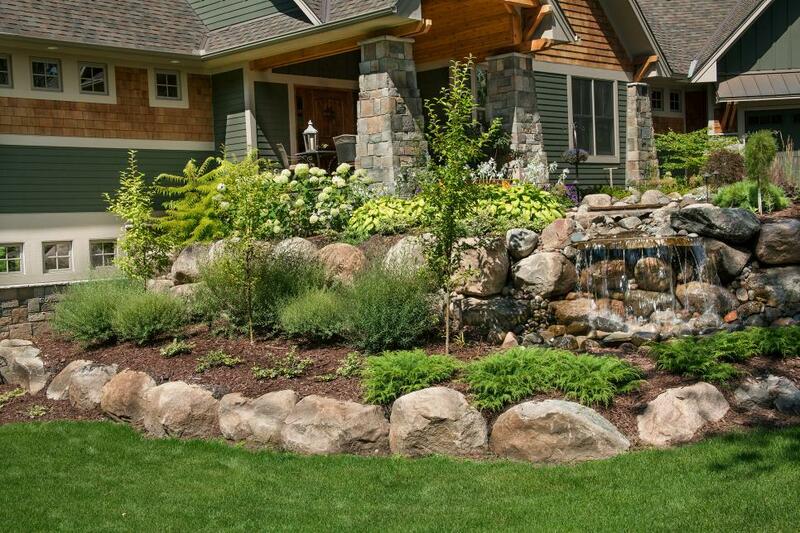 These natural boulders will weather the elements while creating a striking border around the flower beds, as well as establishing the six-foot-wide tumbling waterfall. 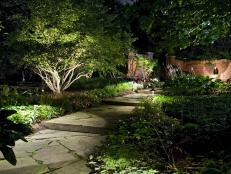 For this courtyard, smart hardscaping is used to preserve historic landscaping. 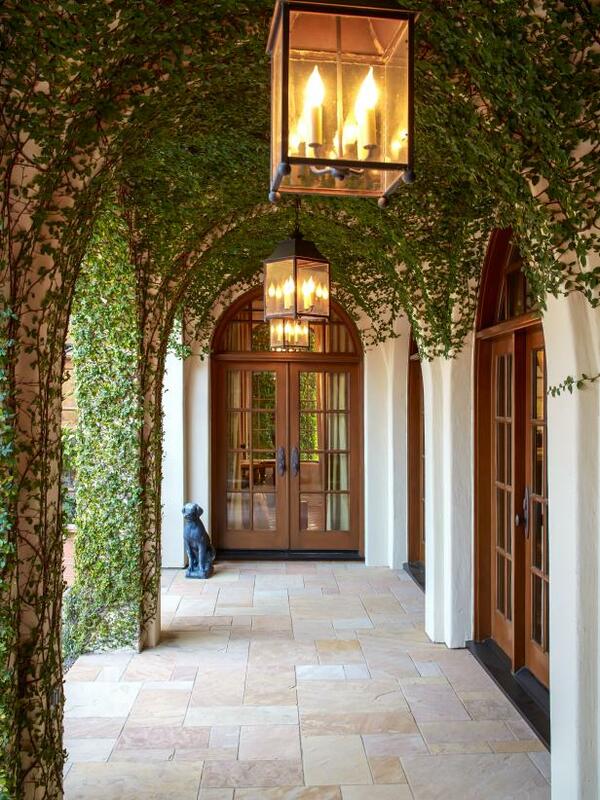 The courtyard was renovated to lessen water usage so the native oak tree could remain a showstopping centerpiece of the home. Simple square pavers are laid in a grid pattern over pea gravel for a cool geometric design that still feels right at home in this Mediterranean-inspired space. With a simple stone pathway leading to it, this stunning wooden pavilion is as unexpected a destination set in the trees as it is in its design. 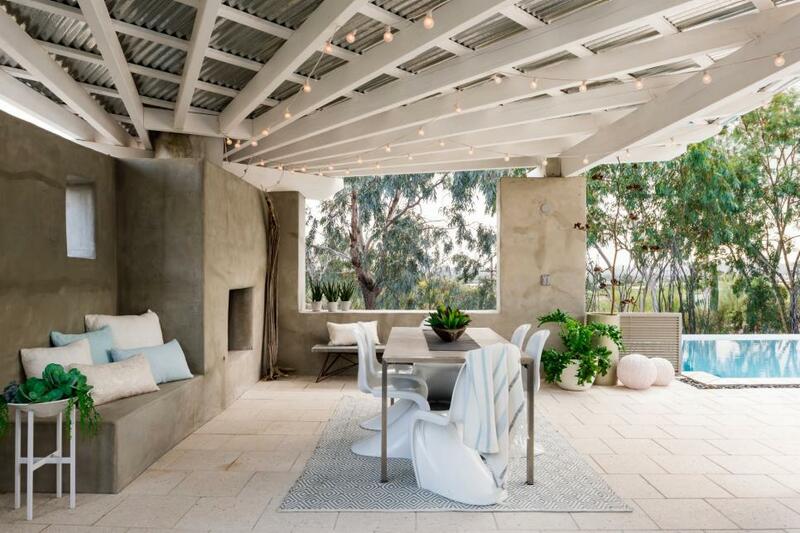 Rather than sticking to the simple rectangular layout of the concrete patio, the pavilion roof comes to an impressive point that's one of a kind. Underneath, a seating area gets cozy in front of the fireplace and the industrial-style table and chairs allow for ideal dining al fresco. Consider your home's style when selecting exterior materials; for instance, this loosely defined flagstone patio adds to the rustic cottage look of the house. Brick is a great option for traditional homes, while granite lends itself to a more contemporary vibe. 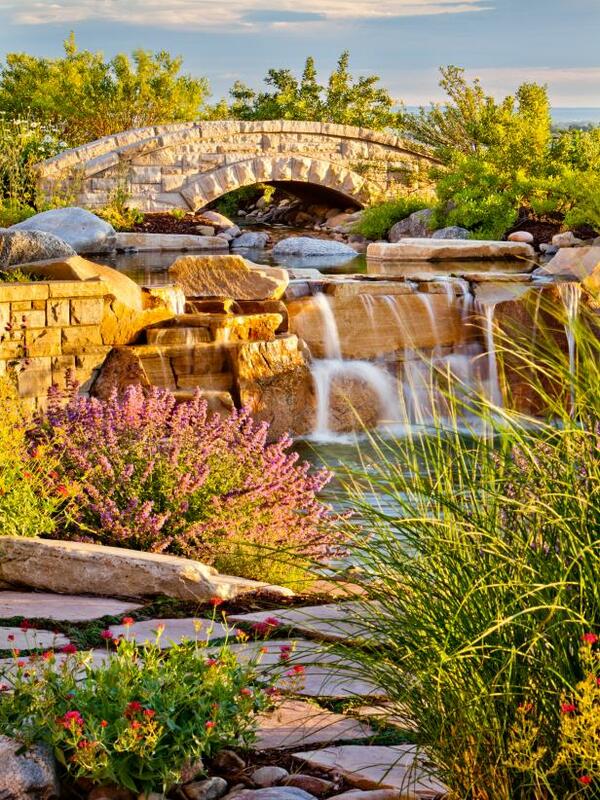 A custom-designed stone bridge allows the homeowners the ability to enjoy every aspect of their wetland-inspired pond. Masonry walls mix with natural boulders to create awe-inspiring waterfalls. 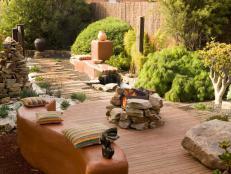 The entire outdoor space is surrounded by native Colorado plantings to add softness and richness to the hardscaping. 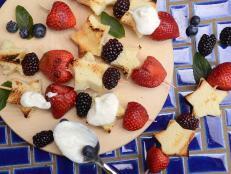 Vary materials to add visual interest. Instead of a solid concrete patio, this transitional outdoor area combines earth toned-gravel with elevated concrete stepping pads to lead guests throughout this home that blends the indoor/outdoor living experience. 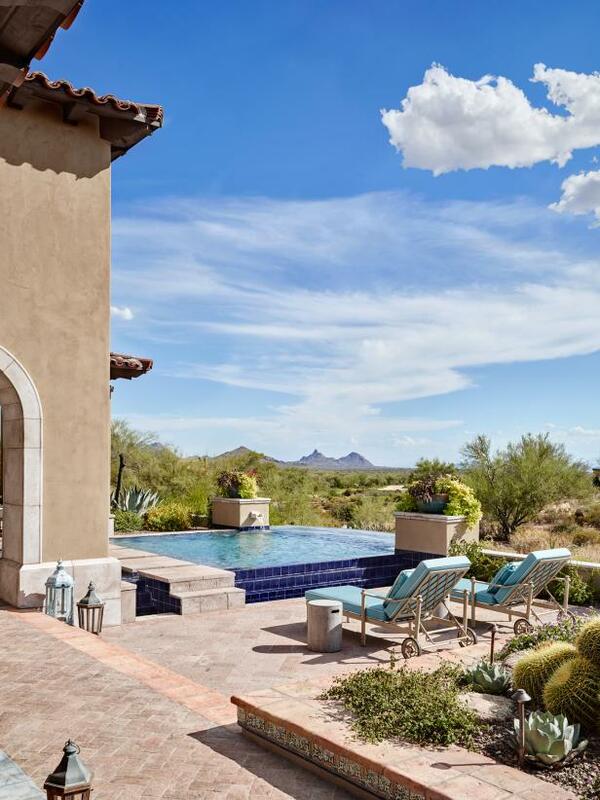 This Arizona home's exterior already meets the quintessential southwestern standards with stucco walls and terracotta roof tiles. 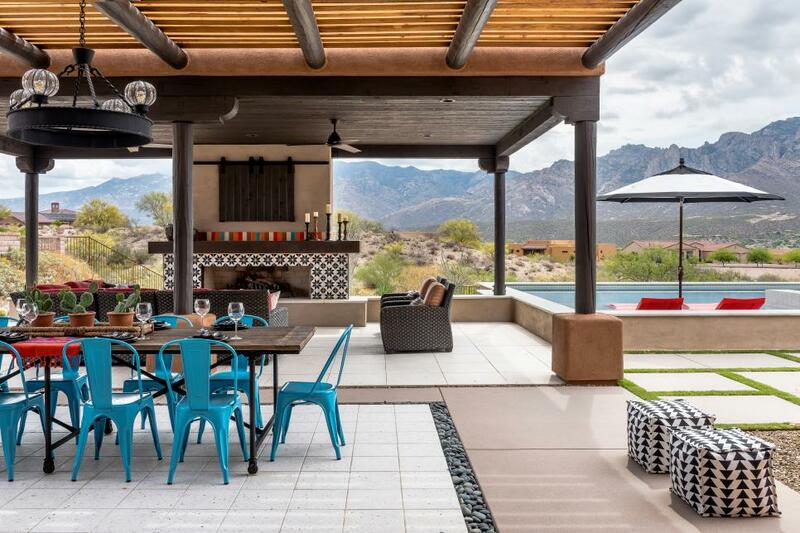 To complement the look, the outdoor space is grounded in sandy bricks and pavers, while blue tiles around the pool and Mexican tiles bordering the patio add life and color to the desert landscape. 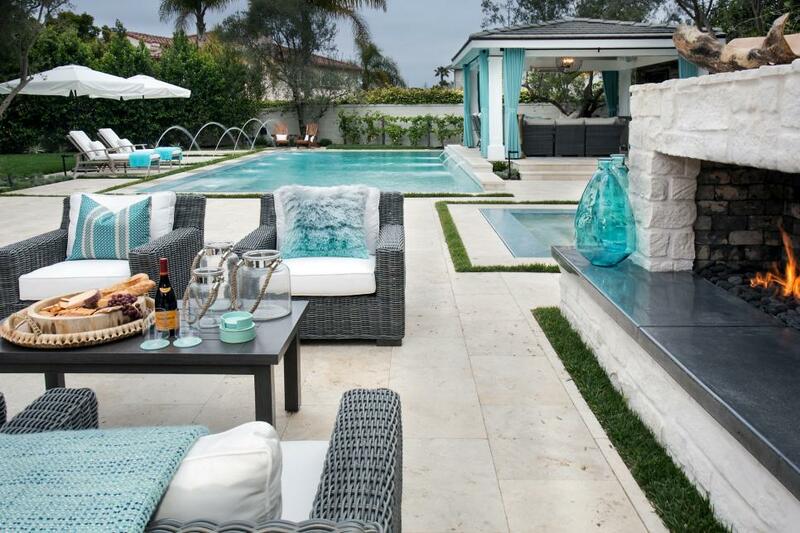 Blue tile insets take a simple concrete patio to the next level and highlight the watery blue of the pool. Mosaic tiles used around the perimeter of the pool and on the stairs are repeated behind the water feature to add an iridescent gleam to the concrete facade. 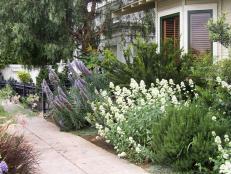 Tiered garden beds full of drought-resistant plants add life and softness to the space. Just like your interiors, if you're a lover of antiques and pieces with a story, look for hardscape materials along the same vein. Over hundreds of years old and reclaimed from China, these antique stone pavers top the benches and walls and are used as floating steps across the koi pond. They completely infuse the space with historic appeal. Simple and classic materials — brick and concrete — combine for an awe-inspiring hardscape in this backyard. Concrete is used throughout the space to create even patios and pathways, while bricks define each line for traditional style and warm color. 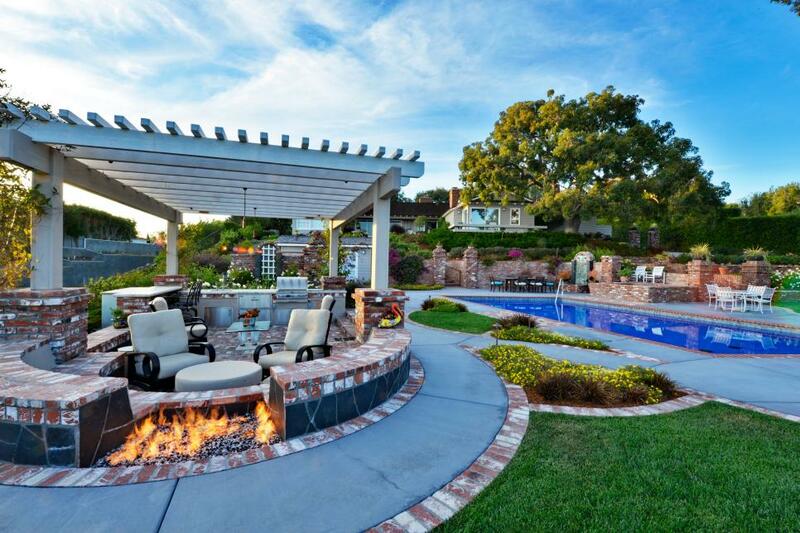 Additionally, the brick wall off the pergola has a built-in fire pit designed so you can enjoy its warmth while taking in spectacular views of the Pacific Ocean. Nothing distracts from the breathtaking views at this desert escape. 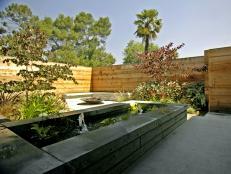 The negative edge lap pool seamlessly flows into the stained concrete patio. Taking its cue from modern style, this outdoor space embraces crisp, square lines. Even the fire pit doesn't interrupt the continuous streamlined look. 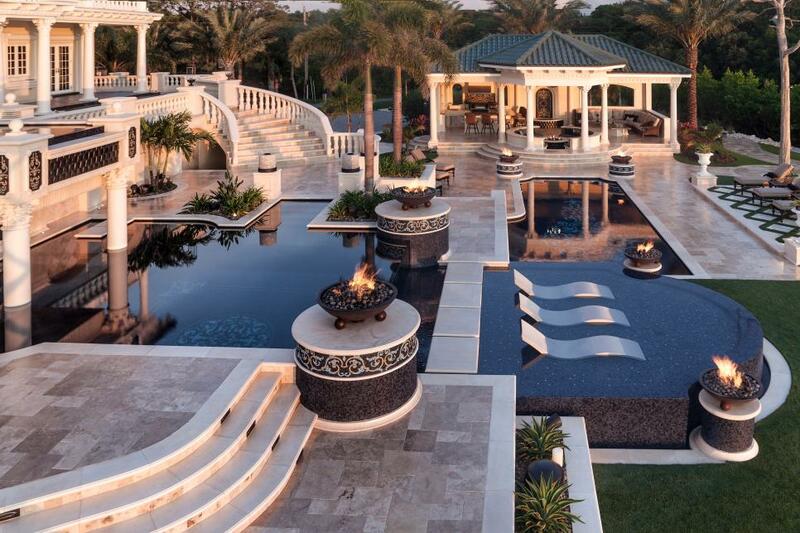 The bird's eye view of this opulent outdoor getaway showcases how each level of this design is a new experience with different pathways, stairs and even floating steps across the pool. Creating a vision of how you will walk through your outdoor space helps determine the right hardscaping and landscaping design. 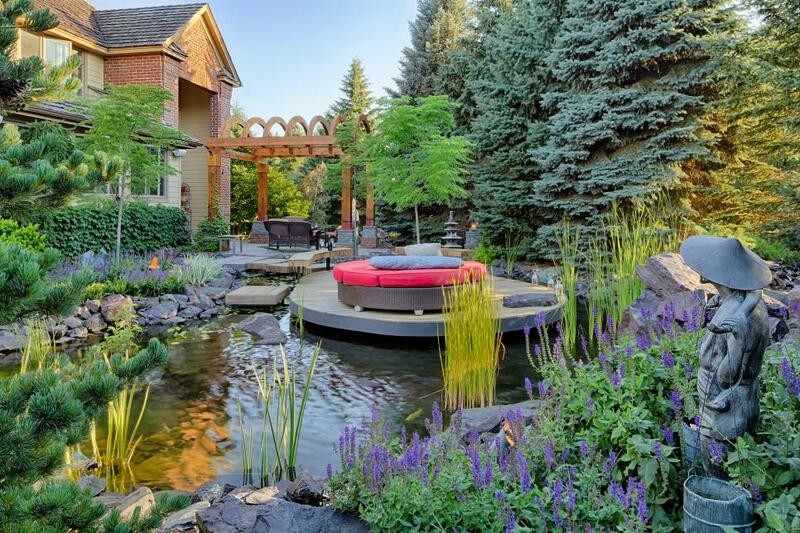 Even simple hardscaping is transformative when encircled by lush natural surroundings. This easy-to-install concrete walkway leads the homeowner and guests through a colorful environment of budding trees and flowers. Mixing a variety of plant and tree heights creates eye-catching dimension and interest. 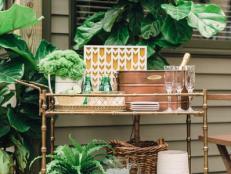 Custom pieces take your outdoor space to the next level. 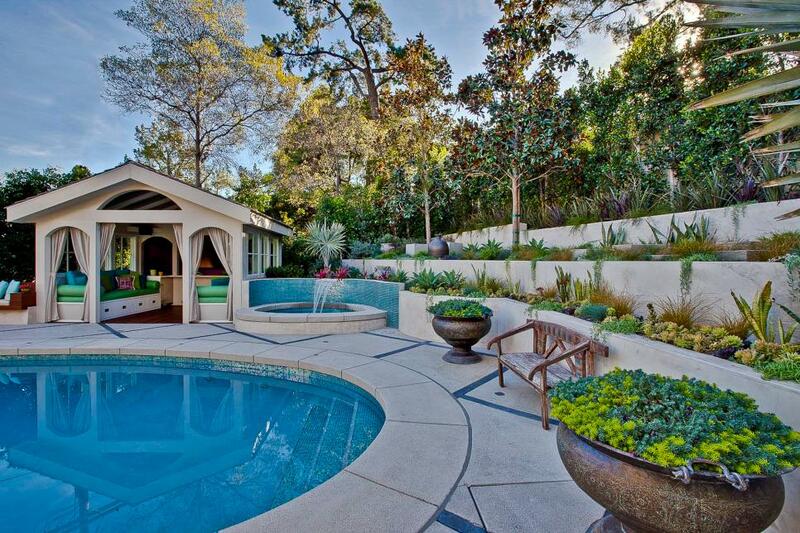 This naturally inspired waterfall is an impressive focal piece for the luxurious swimming pool. 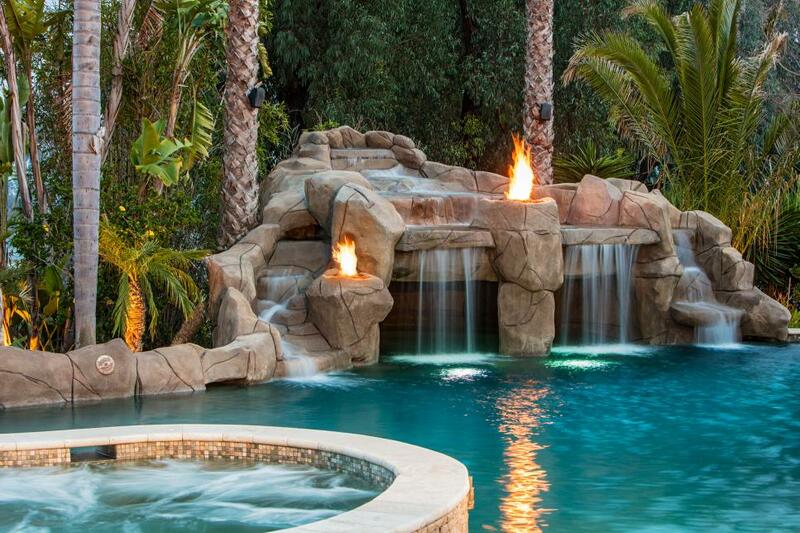 Complete with fire features and LED lights that change the color of the water, the waterfall's cascades bring a beautiful ambient sound to the backyard. Not only do this patio's low walls act as defining borders, but they also double as extra bench seating and firewood storage spots. Flagstone is placed closer together nearer the fireplace to create an even setting for the patio furniture and is then spaced out with grass planted in between as it blends into the surrounding lawn.